Ferris State is on fire. They are 6-0 with the #1 offense in Division II. They are averaging 557.8 yards per game with 348.8 yards per game on the ground. The base play in the offense is the inside veer. 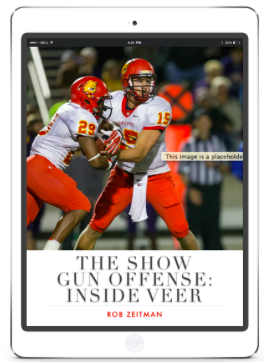 Coach Zeitman shares the details of running this play for every position as well as adjustments to run it against any front in his interactive book The Show Gun Offense: Inside Veer. The Show Gun Offense: Midline will be released soon. Coach Zeitman has the offense rolling again at Ferris State University. At 2-0, the Bulldogs are averaging 369 yards per game on the ground, 575.5 yards per game, and 51 points per game. 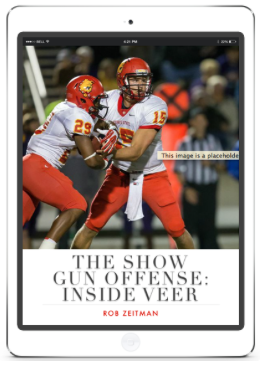 The base play is the inside veer, and Coach Zeitman shares the fundamentals and technique details for each position in his interactive book The Show Gun Offense: Inside Veer.